Geologic time describes the immense span of time—billions of years—revealed in the complex rock surface of Earth. Geologists have devised a geologic time scale that divides Earth's history into units of time. These units are eras, periods, and epochs. A unit is defined in terms of the fossils or rock types found in it that makes it different from the other units. 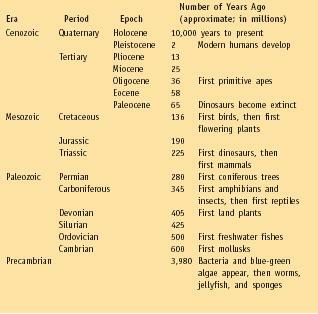 Eras, the four largest time blocks in the scale, are named to indicate the fossils they contain: Precambrian (before ancient life), Paleozoic (ancient life), Mesozoic (middle life), and Cenozoic (recent life). The last three eras are then subdivided into 11 periods. The two most recent periods are further subdivided into seven epochs. Before the eighteenth century, ideas about time and the history of Earth came mostly from religious theories. Many people believed Earth was only a few thousand years old. They also believed that all the physical features of Earth—mountains, valleys, oceans, rivers, continents—were the same as they had always been. Everything that existed on Earth was the same as it had been in the beginning. In the eighteenth century, geologists began to theorize that Earth's lifetime was immense. However, since they lacked sophisticated scientific measuring devices, they could only offer educated guesses. They compared the rock record from different parts of the world and estimated how long it would take natural processes to form all the rocks on Earth. Since that time, geologists have learned to study the strata, or the thousands of layers of sedimentary rock that make up the Earth's crust. Over the course of history, the natural weathering of Earth's surface created sediments (rock debris) that settled in layers on the surface. As the layers built up, the underlying layers were compressed together to form sedimentary rock. A basic geological assumption is that lower layers of rock almost always formed before higher layers. The fossils of changing lifeforms found in the different strata also help geologists determine the long history of Earth. Determining the age of strata by looking at the fossils, position, grain size, minerals, color, and other physical properties contained within them is known as relative dating. Geologists easily identify rocks containing fossils of primitive life-forms as being older than rocks containing fossils that are more evolved or advanced. However, the method of relative dating is exactly that, relative. It is not absolute. In addition, complex lifeforms have existed on Earth for only the last 600 million years. Therefore, their fossils represent less than 15 percent of Earth's history. A more specific and far-reaching method to assign dates to layers of rocks and events that have occurred in Earth's history is absolute dating. This method employs the natural process of radioactive decay. Every rock and mineral exists in the world as a mixture of elements. Every element exists as a population of atoms. At the center of an atom is the positively charged nucleus made up of protons and neutrons. Over time, the nucleus of every radioactive element (such as radium and uranium) spontaneously disintegrates, transforming itself into the nucleus of an atom of a different element. In the process of disintegration, the atom gives off radiation (energy emitted in the form of waves). Hence the term radioactive decay. The nucleus of an atom will continue to decay if it is radioactive. The last radioactive element in a series of these transformations will decay into a stable element, such as lead. Half-life: The time it takes for one-half of the population of a radioactive element to decay. Radioactive decay: The predictable manner in which a population of atoms of a radioactive element spontaneously fall apart. Radiometric dating: Use of naturally occurring radioactive elements and their decay products to determine the absolute age of the rocks containing those elements. Stratigraphy: The branch of geology that catalogues Earth's successions of rock layers. Half-life is a measurement of the time it takes for one-half of a radioactive element to decay. An important feature of the radioactive decay process is that each element decays at its own rate. The half-life of a particular element, therefore, is constant and is not affected by any physical conditions (temperature, pressure, etc.) that occur around it. Because of this stable process, scientists are able to estimate when a particular element was formed by measuring the amount of original and transformed atoms in that element. This is known as radiometric or isotope dating. The age of the whole Earth is deduced from the ages of other materials in the solar system, namely, meteorites. Meteorites are pieces formed from the cloud of dust and debris left behind after the beginning of the solar system. The meteorites that fall to Earth today have orbited the Sun since that time, unchanged and undisturbed by the processes that have destroyed Earth's first rocks. Radiometric ages for these meteorites fall between 4.45 and 4.55 billion years old. Good treatment of subject. Major assumptions listed. Nice anc clean! CAN U PLEASE SEND ME THE DISTRIBUTION OF DIFFERENT INDEX FOSSILES IN THE WORLD.